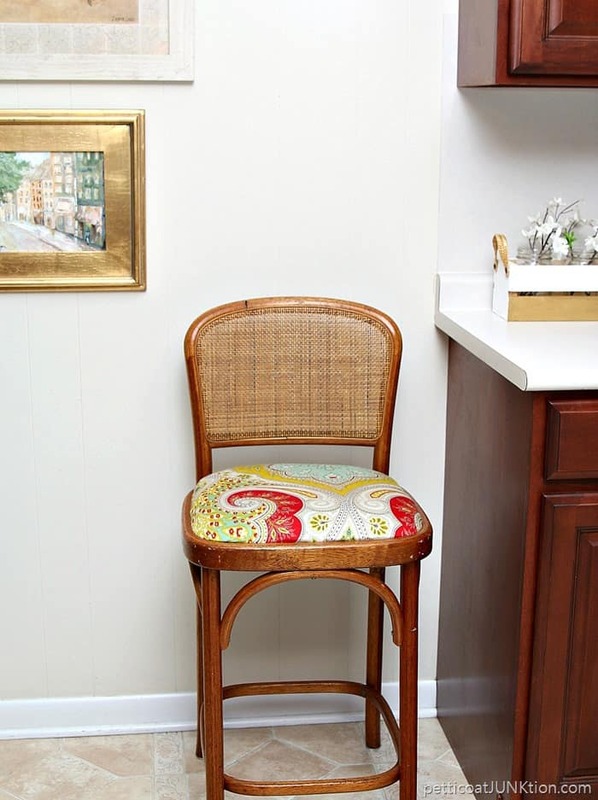 The recovered bar stool seat is sporting fabric from a shower curtain. The fabric design is beautiful and the colors are bold. Okay guys, if you looked at the photo and went ..”Oh my word! When is she going to run out of that fabric!”….I’m sorry. 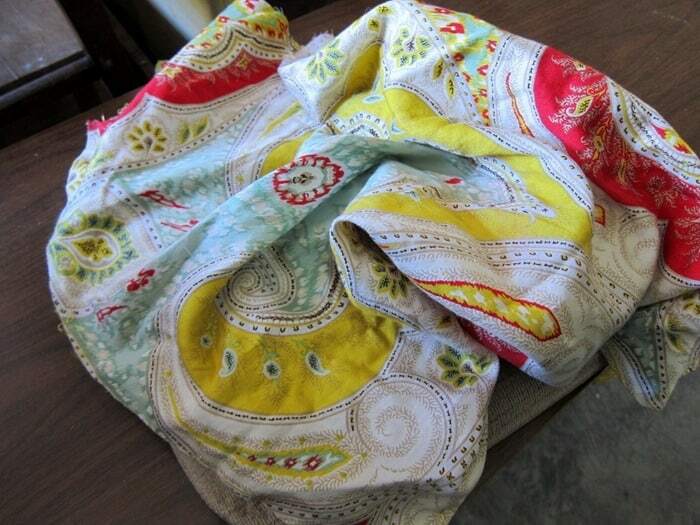 This is the last project using fabric from the $2 thrift store shower curtain. I promise. But maybe you said “Oh wow! That fabric is so awesome, I hope she never runs out”…..then you’re talking my language. I went to My Favorite Junk Shop on Saturday and came home with a few goodies. I got the cane back bar stool for $5. I wanted it for myself. On the drive home from the shop I was thinking about “the fabric’ and wondering if there was a big enough piece left to cover the stool. 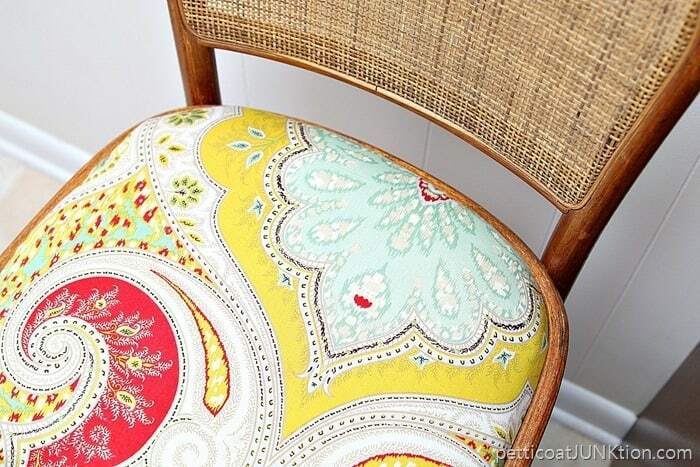 Wouldn’t it be awesome painted a lipstick red or cool turquoise with that beautiful fabric on the seat! It’s so darn hot here I don’t feel like working in the workshop or anywhere else. Well, yesterday afternoon I couldn’t stand it anymore. I headed down to the workshop and got busy on two projects. The JTS helped me out….a lot. We finally figured out how to get the covered seat off of the stool. 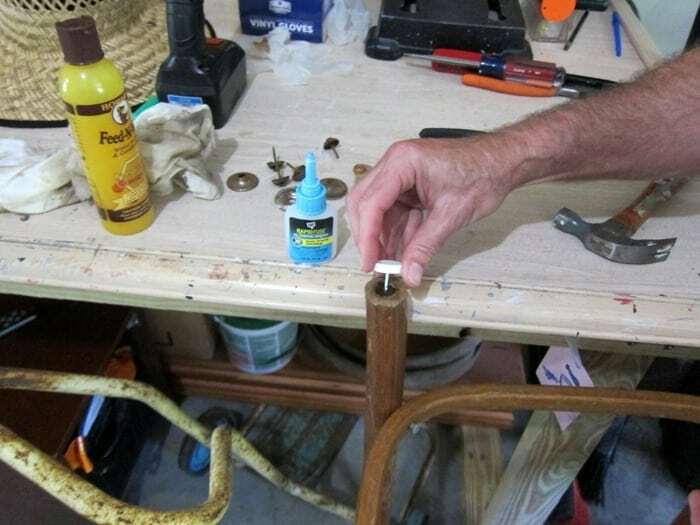 At one time there were castors on the bar stool but all that was left were broken thingies. The JTS removed them and then added plastic floor protectors. The holes from the original wheel things were a little large so we used some DAP RapidFuse (my new fav adhesive, Amazon Affiliate link) to stick the protectors to the bottom of the legs. 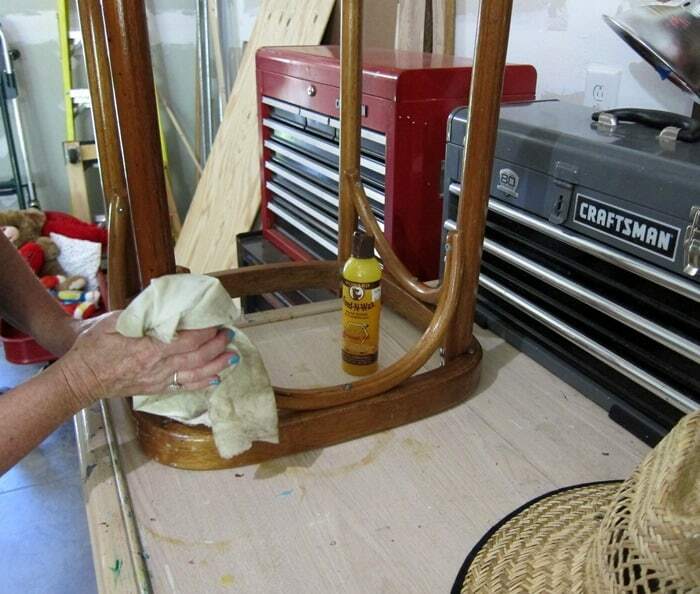 Once I laid the fabric over the stool seat I decided painting was out. The original wood finish was perfect. I spruced up the finish with Howard’s Feed ‘n Wax ( Amazon Affiliate Link). If you missed the post on the pretty fabric garland you can see it here…. Continuing The Curtain Saga | Fabric Garland. 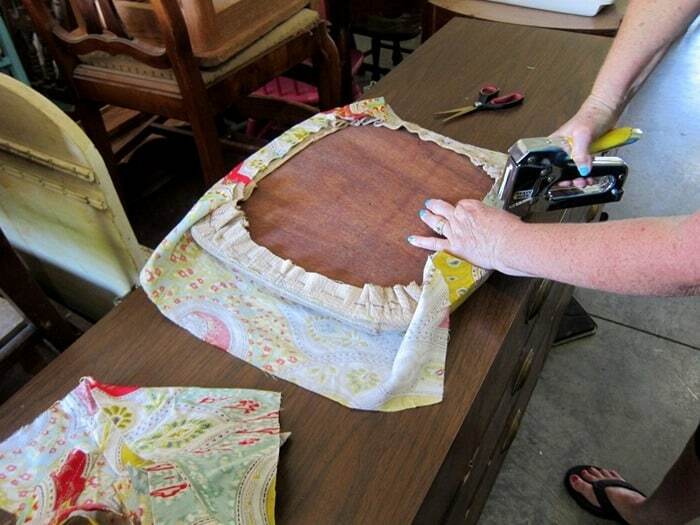 Get a look at the DIY Kitchen Curtains here. 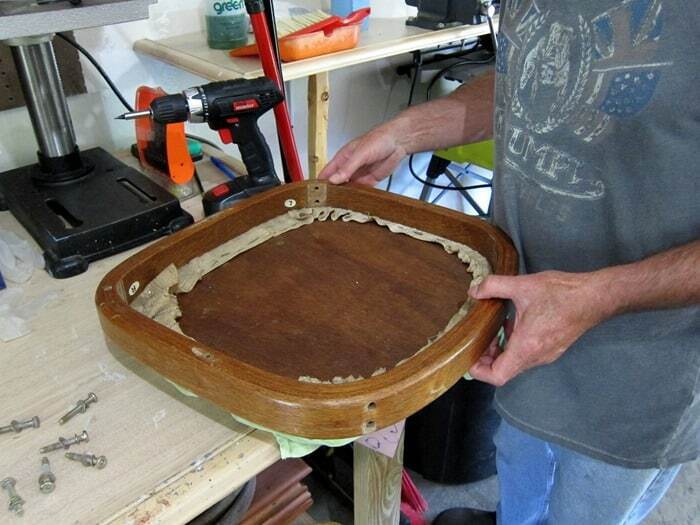 Covering a fabric chair seat is about the easiest DIY you can do. 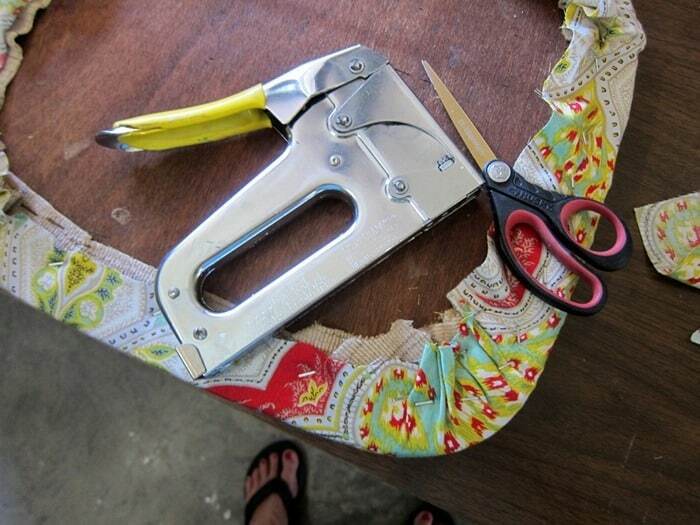 Cut the fabric to size with enough to cover the seat and staple to the underside. Start on one side then do the opposing side…then the remaining two sides….stretching the fabric tight as you go…then do the corners working the fabric free of wrinkles the best you can. Nothing to it. It takes 10 minutes tops. The stool in our kitchen being replaced by the cane back bar stool was wood and all white. The stool sits near the cook stove. Sofi often sits there and chit chats with the cook or draws pictures using the counter as a desk. This bar stool looks so much better. And for $5! See what I mean about the original finish with the fabric? Looks great. I cut the fabric piece so I could get a lot of that pretty red on the seat. 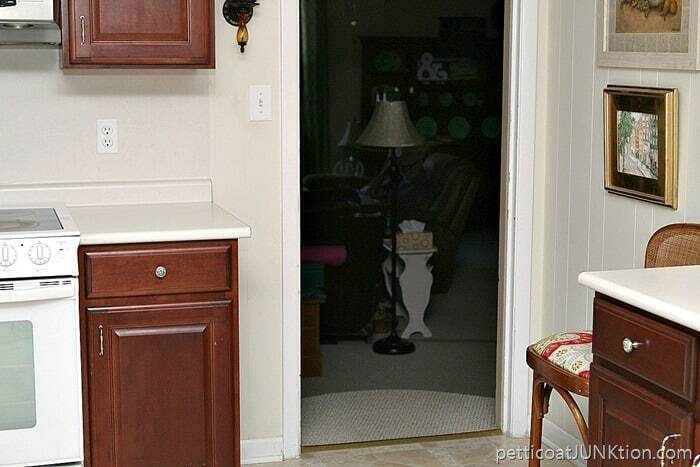 I took this shot so you could see where the bar stool is in relation to the stove and the cabinets. The door leads into the den…our main hangout. I see so many homeless chairs that just need a little love. This is such a great tutorial on how to give them some love. I don’t blame you for using that fabric more than once- it is fabulous! I really like how it gave that corner a big splash of color! Great thrift store find. 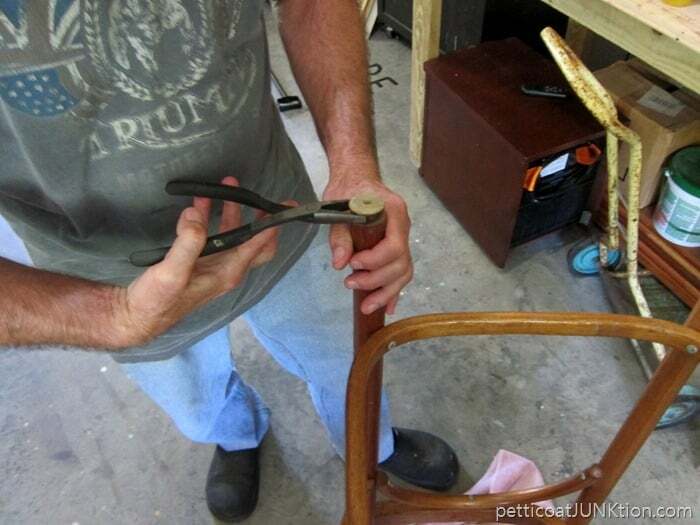 No wonder you loved that fabric, wanted to use it on cute cane stool. Like cane stool with new fabric much better. Nice kitchen what can be seen of it. I see you are as busy as always, cranking out wonderful projects. I miss seeing what you’re redoing,are great inspiration. Hope all well with you and yours. Awesome find and beautiful finished project! 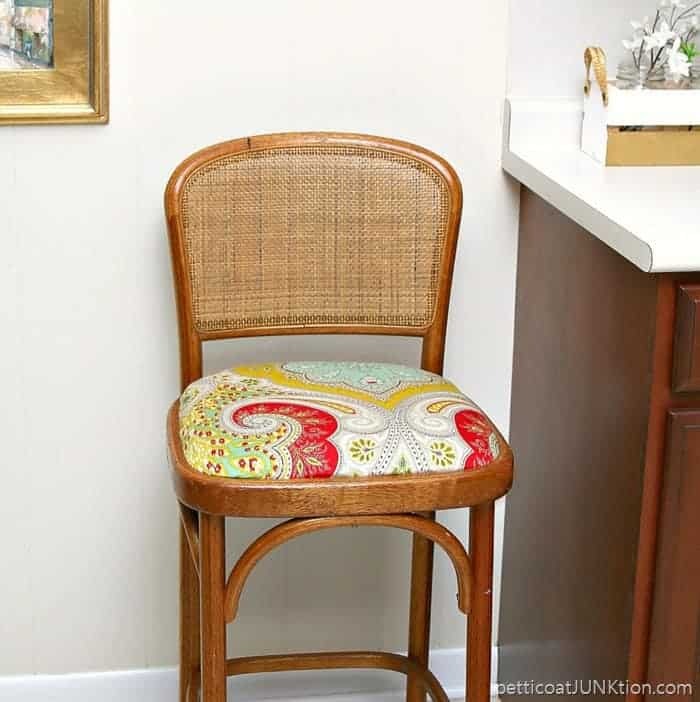 It looks great where you have placed it in your kitchen and I agree with a previous post that having the stool and curtain fabric the same will tie it altogether. I have a question-you did not remove the old fabric from the stool and stapled the new fabric right on top of it, correct? When/why would you decide to do this? I have a vinyl chair that I am contemplating covering and don’t think that would be a good candidate to, say, leave the vinyl on and cover with fabric since two different textures (?). Just curious about the thought process and with your experience, would value your opinion. I love that fabric! 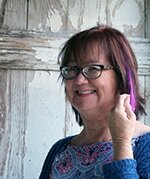 You certainly do find treasures, Kathy! What is it about that fabric that we love so much???? That is so pretty. I love it. I agree it is too hot to work outside of the A/C right now. 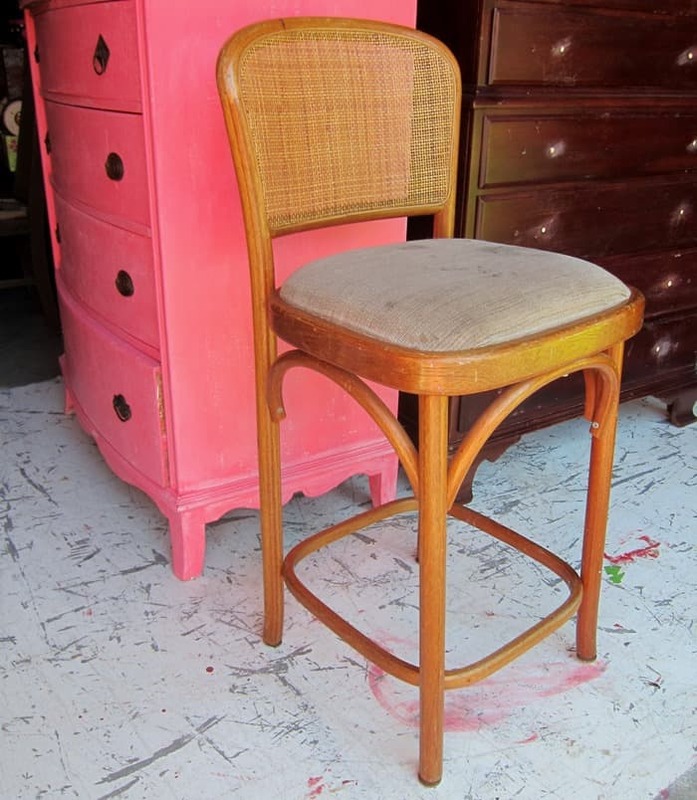 The finish on the stool is still very pretty, but you got the wheels turning in my head when you mentioned painting it red or turquoise. Either one would look great. However it does look great as it is. That $5 stool was a good find. Love the new chair and fabric, it looks fantastic, bright and cheery! Kathy I love it!!! 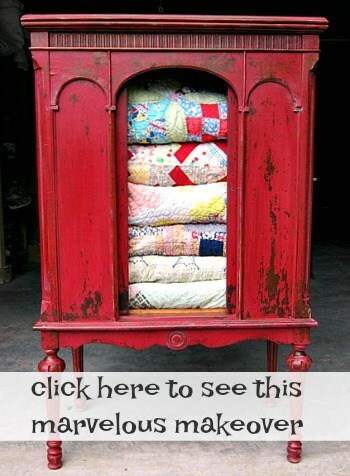 I love the fabric and am so glad you have found more uses for it! So bright and cheery it just makes you smile when you see it! !